Spring tail with a size of around 1 mm, made with magnification factor 4 and f/16. 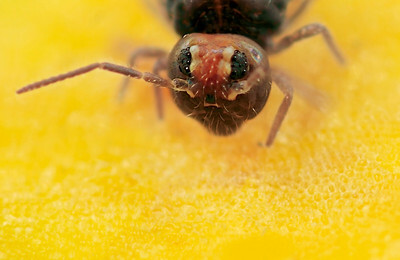 Spring tail, small primitive insect with size around 2 mm, made with magnification factor 10 and f/7.1. 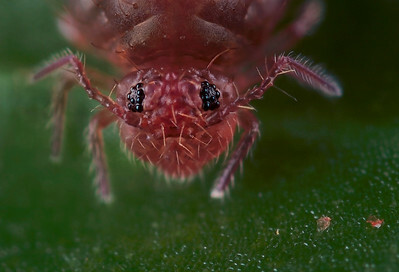 Profile springtail (Collembola) with a size of around 1 mm, made with magnification factor 8 and f/7.1. 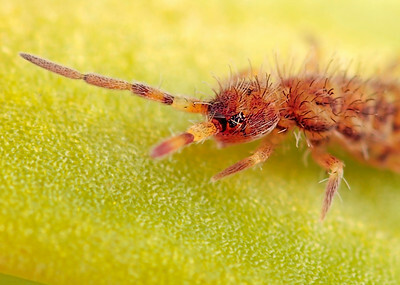 Members of Collembola are normally less than 6 mm long. Most species have an abdominal, tail-like appendage, the furcula, that is folded beneath the body to be used for jumping when the animal is threatened. 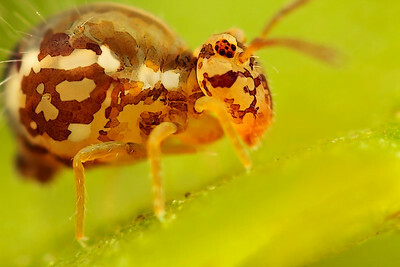 It is held under tension by a small structure called the retinaculum and when released, snaps against the substrate, flinging the springtail into the air. All of this takes place in as little as 18 milliseconds (ref. Wikipedia). Profile springtail (Orchesella cincta) with a size of around 2 mm, made with magnification factor 10 and f/6.4. 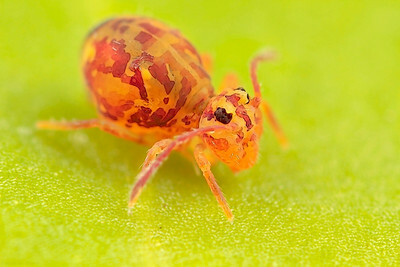 Members of Collembola are normally less than 6 mm long. Most species have an abdominal, tail-like appendage, the furcula, that is folded beneath the body to be used for jumping when the animal is threatened. 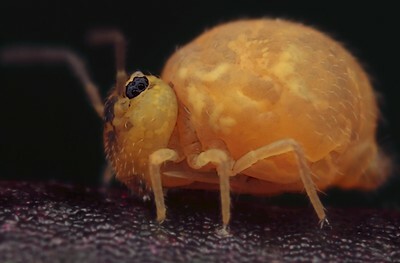 It is held under tension by a small structure called the retinaculum and when released, snaps against the substrate, flinging the springtail into the air. All of this takes place in as little as 18 milliseconds (ref. Wikipedia). 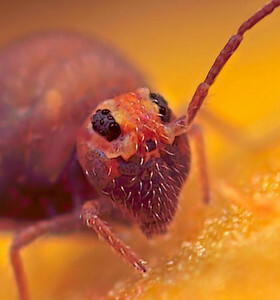 Portrait springtail (Collembola, Bourletiella hortensis) with a size of around 0.75 mm, made with magnification factor 14 and f/5.6. 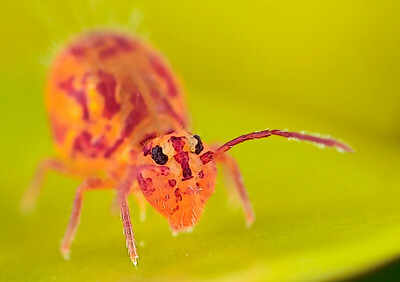 Members of Collembola are normally less than 6 mm long. Most species have an abdominal, tail-like appendage, the furcula, that is folded beneath the body to be used for jumping when the animal is threatened. 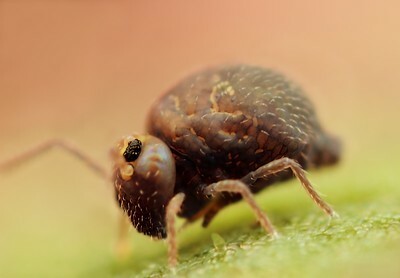 It is held under tension by a small structure called the retinaculum and when released, snaps against the substrate, flinging the springtail into the air. All of this takes place in as little as 18 milliseconds (ref. Wikipedia). There are ca 8000 described species worldwide. Collembolan fossils from the Devonian (ca 400 million years ago) are among the oldest known records of terrestrial animals. More information can be found at The picture has been made with the Canon 7D, the Canon macrolens MP-E 65mm/f2.8 , a Canon 2x teleconverter and a Soligor 1.4x teleconverter. 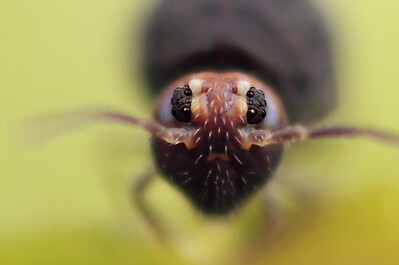 Portrait springtail (Collembola, Bourletiella hortensis) with a size of around 1 mm, made with magnification factor 18 and f/5.6. 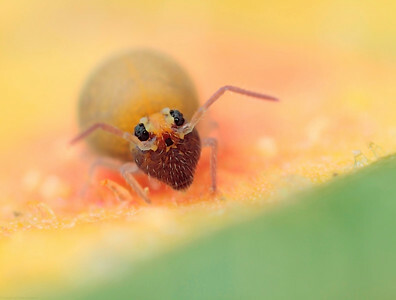 Members of Collembola are normally less than 6 mm long. Most species have an abdominal, tail-like appendage, the furcula, that is folded beneath the body to be used for jumping when the animal is threatened. 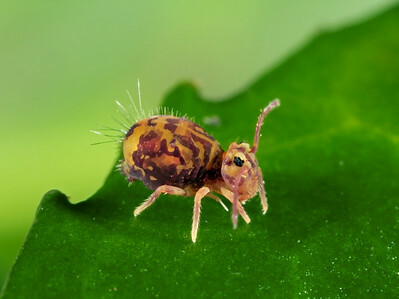 It is held under tension by a small structure called the retinaculum and when released, snaps against the substrate, flinging the springtail into the air. All of this takes place in as little as 18 milliseconds (ref. Wikipedia). There are ca 8000 described species worldwide. Collembolan fossils from the Devonian (ca 400 million years ago) are among the oldest known records of terrestrial animals. 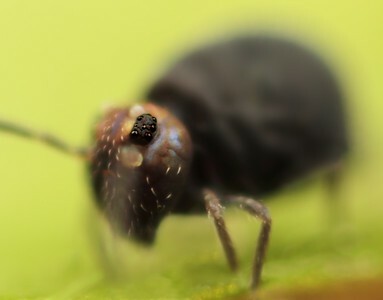 The single eyes (ocelli) are sensitive for movements in the environment. The function of the lightly colored eye brow functions as an optical sensor which measures the amount of light in the environment and regulates the amount of light to be interpreted by each of the 8 ocelli. With thanks to Frans Janssens for the detail information. The picture has been made with the Canon 7D, the Canon macrolens MP-E 65mm/f2.8 , a Canon 2x teleconverter, a Canon 1.4x teleconverter and a Soligor 1.4x teleconverter. 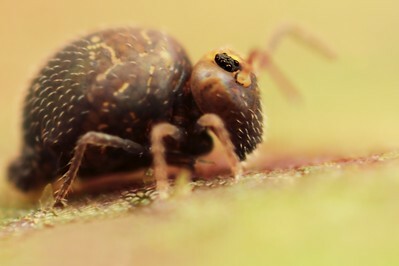 Springtail (Entomobrya sp) with a size of around 2 mm, made with magnification factor 14 and f/5. 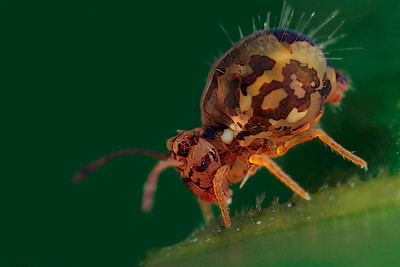 Members of Collembola are normally less than 6 mm long. Most species have an abdominal, tail-like appendage, the furcula, that is folded beneath the body to be used for jumping when the animal is threatened. 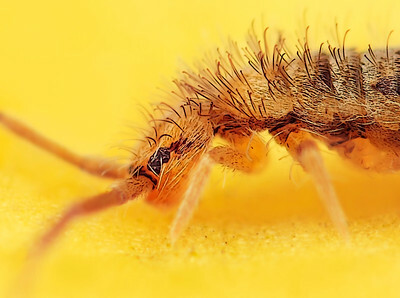 It is held under tension by a small structure called the retinaculum and when released, snaps against the substrate, flinging the springtail into the air. All of this takes place in as little as 18 milliseconds (ref. Wikipedia).